Cranberry Moscato D’Asti Cocktail (also delicious with Prosecco) is a refreshing and simple way to enjoy the taste of summer with a kick! Print off this recipe that is loaded with fresh fruit and a splash of your favorite juices (like deliciously crisp cranberry!) that bring on the perfect sweet and sour drink you have been dreaming of. Summer isn’t all about your kids being out of school! It’s also about late nights with your spouse, ladies meet-ups, and beautiful sunny mornings by the pool. 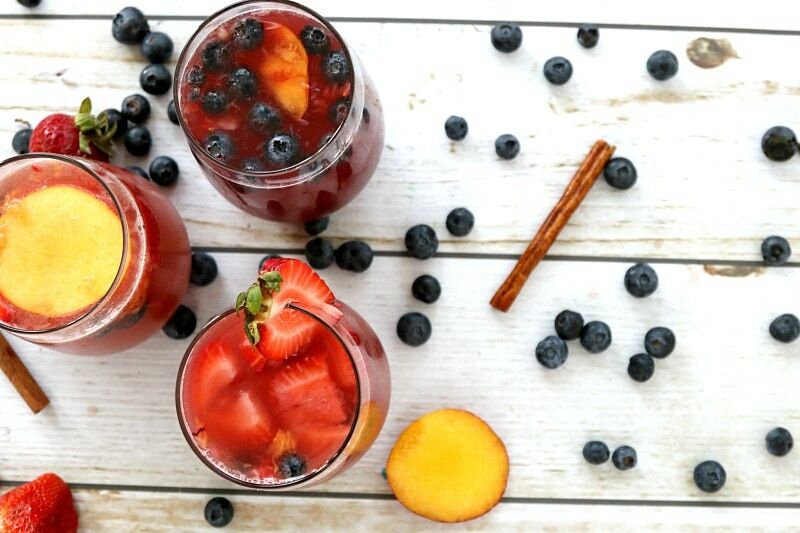 And there is nothing more relaxing than creating a perfect summer drink filled with delicious fruit and topped with your favorite alcohol. Do not settle for less than this sweet and sour drink that will have your guests begging for more! Topped with cranberries, strawberries, and peaches (of course just my recommendation, feel free to add your own favorites) and filled to the brim with a balancer like Cranberry juice, you cannot go wrong sipping on this every Sunday! Let’s get started on the drink of the summer. Please note that this can be made with Prosecco as well if you prefer more of a dryer drink vs a sweet! To create a delicious, refreshing and perfect cocktail for the summer, you have to start with fruit! To create a little fruit compote, simply combine fresh fruits and crush down to your liking. I prefer a bit chunkier fruit to float in my glass, so I used a mortar and pestle. You can also blend in a blender if you want a smoother fruit that blends well. I do not believe there is a wrong answer here! While cranberry juice is an important part of this drink, fresh cranberries make a great addition as well. Cranberries are easy and convenient to use in any form, making them a perfect fit for sweet or savory meals and recipes. You can usually get them in the frozen section if not available fresh. Now add 1/3 cup Lemonade (I prefer with pulp for this), 1/3 cup OJ (with pulp is also a good fit for this), 1/3 cup Cranberry Juice (balances the sweet, do not skip!) and then top to the brim with your favorite drink like Moscato D’Asti (for a sweet drink) or Prosecco (for a dryer drink). The cranberry gives it its gorgeous red color that is perfect for summer! Now add 1/3 cup Lemonade (I prefer with pulp for this), 1/3 cup OJ (with pulp is also a good fit for this), 1/3 cup Cranberry Juice (balances the sweet, do not skip!) and then top to the brim with your favorite drink like Moscato D'Asti (for a sweet drink) or Prosecco (for a dryer drink). The top five mentioned food banks will each receive a $1,000 donation from the Cranberry Marketing Committee. This looks delicious. Perfect for summer! Plus I love cranberry juice!